A series of blog posts back in 2008 made it abundantly clear that our dear friend Lost City was in love—with a Cobble Hill townhouse undergoing extensive renovations. "Their work continues to exceed all expectations," LC gushed, "proceeding at a glacial pace, but getting it right." 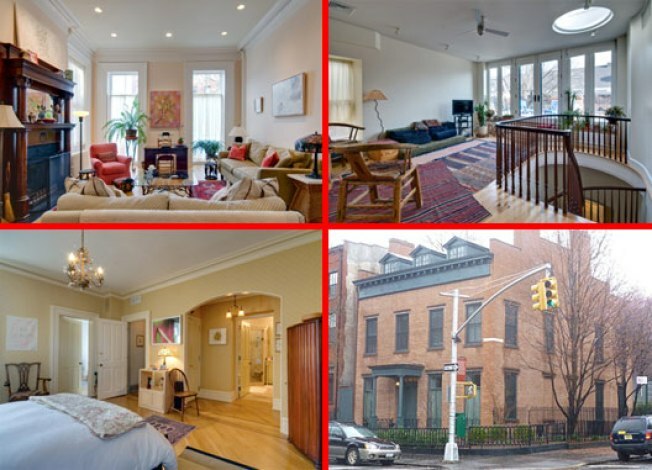 That house, at 491 Henry Street (on the corner of Degraw Street at the edge of the Cobble Hill Historic District) is more of a mansion, a freestanding 50-foot monster that's one of three neighborhood homes built on two lots. We picked up that nugget of trivia from the property's listing, because 491 Henry Street is suddenly for sale for $7 million. The photos give us a glimpse inside the long-in-the-making renovation. Lost City's take? "Overstuffed." Oh, the cruel sound of a heart breaking! As befitting a home of such grandeur, the brokerbabble is mighty thick, and worth a read. Here are the details minus the eloquence: owner's triplex, two rental units accessed separately (a 2BR, 2BA on the second floor and a 1BR on the first floor) bringing in an annual combined rent of $56,400, period details galore, mahogany everywhere (including up on the roof deck), upgraded modern guts and a "bluestone patio off the kitchen has legal curb cut access to the street and can provide gated parking for up to 4 cars." The house is also surrounded by "landscaping with automatic in ground irrigation," which we take to mean a lawn and sprinklers. So which celebrity is next on the Manhattan-to-Brooklyn move list?